Benjamin Cayetano: First highest-ranking elected official of Filipino ancestry in the State of Hawai‘i: 3rd in a series. My mom framed a photo from the first Cayetano Inaugural Ball. A beaming Ben Cayetano and Mazie Hirono pose amidst a small contingent from the Valley Isle. My mother, more than me, can identify who made it over for the event: Bobby Baluran, Rose Gabuat, Fely and Vincent Dumayas, Dolores Cabebe, Norma Badoyen, Zachary Paz, Wes Wong, Raymond Ono, Ry and Marla Barbin, Elsie and Manabu Kimura, Bill Howerton, Ted Yamamura, Audrey and Anthony Takitani. In the twenty-five years since then, some are noticeably grayer or balder or heavier now. Some have now passed away. One guy remains a mystery—someone’s date or someone who just happened to step into the photo. When someone wins, everyone wants to be associated with the victory. When you lose, you don’t want those photographs lying around. My mom has an album full of people who can take some credit for 1994. In the Spring of 1994, a rather worn Lt. Gov. Ben Cayetano flew in to Kahului Airport for a small coffee hour at a local trial attorney’s Ha‘ik&#363; home. I had been volunteered to drive him in my 1987 Nissan Sentra, a relic from law school in the Bay Area that I hoped would make it up to Ha‘ikū and back to the airport in a timely manner. These kinds of gatherings at private homes marked the early parts of any conventional local statewide campaign. As time got closer to the election, a candidate’s time increasingly was pulled away to larger, organized events. But that March, you could still have an opportunity for smaller and more informal meetings. In fact, Ben had come over for a couple of coffee hours in the winter of 1993 when people didn’t even have the gubernatorial election in mind. Those were especially intimate talks. As I briefed him on the two dozen or so people who would be at the event and talked about some of the issues in East Maui and the county, we pulled over on H&#257;na Highway so he could collect himself. A few would be supporters. Most had never met him and knew little about him other than his two-time election as John Waihe‘e’s understudy—the first to serve two terms as Lt. Governor. I may have given him the impression that to the group, his years in the legislature and even his service as Lt. Gov. was akin to ancient history. Ben had come in from the Big Island where he had had a grueling schedule—several meetings with community leaders and a number of coffee hours. The Big Islanders explained they simply had more ground to cover. The Big Islanders always had more ground to cover. And I could see Ben was tired. During the two statewide races for Lt. Gov., the Maui campaign had been coordinated by Maurice Morita. (In 1986, Fred Evangelista had failed to convince Gladys Baisa, who was recommended by Elmer Cravalho, to be the Maui coordinator.) Morita, associated in some way with the teachers’ union, was perceived by me more as the youth soccer guy during the short time I had been home. But Maurice would not be continuing in that role because he was considering a change in his employment and residence. The person that had been suggested to the Honolulu coordinators for the Maui spot was a forty-four year old Wailuku lawyer, Anthony Takitani. Tony, out of college, had been elected to the 1978 Hawai‘i State Constitutional Convention and then to the State House of Representatives from one of the old multi-member districts. He was related on his mother’s side to the extended and business savvy Tavares clan and on his father’s side to the equally entrepreneurial Takitanis. His relative Hank had also served in the legislature. But in the reapportionment that created single member districts, Tony had been effectively gerrymandered out of his seat. Instead of running against one of his House colleagues, Tony made a run against State Senator Gerald Machida, an HGEA leader, for a seat that included Molokai and L&#257;na‘i. Tony lost in a close race. Machida would eventually lose his seat to Republican Rick Reed. Tony went off to law school. After returning to Maui, Tony had not taken a prominent role in any political campaign until 1992. Instead, he focused on community affairs, his young family and his legal practice. But in 1992, Tony agreed to take on one of the easiest jobs in Hawai‘i campaigns—coordinating on Maui with local lawyer Ry Barbin the re-election of U.S. Senator Dan Inouye. However, Maui turned out to be the center of that campaign. 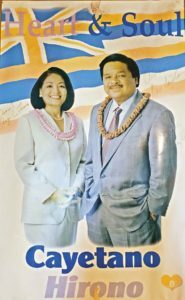 Inouye faced a direct appeal to the Filipino voters by Republican challenger Rick Reed who had distributed a Philippine Christmas video featuring his then Filipina wife. Inouye also faced a primary challenge from County Councilmember and maverick Democrat Wayne Nishiki, a friend of Reed. Reed and Nishiki were also part of the Independents for Godly Government created by Chris Butler who led an off-shoot of the Hare Krishna sect. In a relatively bruising campaign for the senior U.S. Senator, Inouye handily survived both challenges despite some salacious mudslinging and Nishiki’s theatrical use of chains to protest the Democratic Party attempt to enforce censure rules for Wayne’s support of his old buddy Reed. In truth, Ben knew Tony. They had served in the Legislature together briefly. In Tony’s losing campaign for State Senate over a decade before, Ben had campaigned on L&#257;na‘i for him. Even though his Filipino legislative colleague worked the Pineapple Island with him, Tony lost L&#257;na‘i where the ILWU held strong sway. In 1994, Tony could joke that Ben did not show enough pull with the Filipinos there to offset Machida votes elsewhere in the district. Local real estate appraiser Ted Yamamura also agreed to assist with logistics. Since they both had fancier, roomier and newer trucks and sports utility vehicles, the Spring coffee hour in Ha‘ik&#363; was also the last time I would be asked to do the driving. In the world of counting campaign credit, some people put a big value on being there at the beginning. Others argue that contributions at crucial times or in special ways matter more. Some folk make sure they’re there when the candidate comes in from Honolulu. In a grassroots campaign on the neighbor islands, you come to value the people who came down regularly to the headquarters. You notice the folk who came down just to eat campaign chili and shoot the breeze about the way things were done in the old days. But you appreciate the retirees and the others who put time in to answer phones, send out letters and work on the mundane tasks. You’re aware of and welcome big names in the community who lend their influence. But you come to like and admire the zealots who man the phones, hit the streets to distribute signs and brochures, or handle all the sign waving. A&B leased to the campaign, as is, the former Peggy’s and Johnny’s store in Kahului Shopping Center. With the help of Greg Endo, some of his buddies and a host of volunteers, the place was cleaned up, painted and air-conditioned. George Ito lent us the use of some tables he had constructed. The local group scraped together enough money to buy some plastic stacking chairs and someone donated some used computers and monitors. County social worker John Tomoso took on organizing sign waving. Headquarters volunteers Manabu Kimura, Tony Arakaki and others made the daily phone calls to remind volunteers who had signed up for that task. John put together a schedule, carried the signs and t-shirts and selected the sites to reach the core Central Maui Democratic voting bloc. As the summer went on, others volunteered to handle sign waving in other parts of the island but John got the regular routine going. Retired state legislator Herb Honda volunteered to visit all the senior citizen clubs. Herb methodically covered the lunch programs over the course of the summer with help from a few volunteers. Other retired legislators like Mark Andrews and Mamoru Yamasaki also pitched in with different constituencies. Even if they had not been close allies in the legislature, the former Valley Isle legislators decided to support Ben rather than semi-Mauian Jack Lewin. A lot of our campaign material was handmade. A bunch of us worked for several days on making yard signs by hand. It took several days: one day for cutting leftover and donated sheets of lumber (even reusing signs from retired politicians like Rick Medina), another day for whitewashing each sign and then another two days for hand silk screening the red, white and blue flag logo to allow proper drying. Another group worked on putting the signs up at strategic spots throughout the island, including the task of asking the homeowners for permission. Wes Wong and Fred Duldulao took on the task of budgeting for and feeding the volunteers. Canvassing, along with sign waving, had been the basic campaign tactic for politicians in Hawai‘i. A challenge for the campaign was getting support for walking from the campaign veterans. First term GOP Maui Mayor Linda Crockett Lingle was also up for re-election. Longtime council member Goro Hokama had decided to enter the race, drawing a lot of experienced campaigners into that tough county-wide contest. As a result, the Maui group needed to develop our own cadre of workers. Without much money coming in from the main campaign on O‘ahu, Tony and Ted had determined that we would canvas the entire island, or as much as possible with all the new agricultural subdivision communities and closed building complexes. 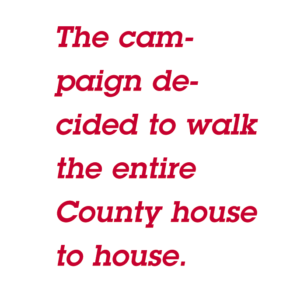 At some point, the campaign decided to walk the entire County house to house. We had groups that committed to one or two areas or one or two weekends. The local unions promised us a couple of weekends as well. But there were a few who came almost every week, including the ferry trips to L&#257;na‘i and Molokai and the long early drives to H&#257;na and Lahaina. They got t-shirts and a hot lunch and our gratitude. 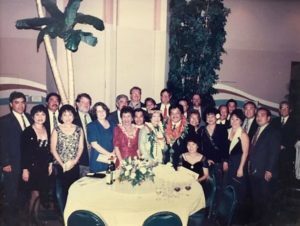 Some of the younger members of the bar like Anthony Vierra, Herman Ling, Joseph Toma, Grant Chun, Craig Nakamura, Joy Yanagida and Geronimo Valdriz would put in a Saturday morning then would go off to work or their other commitments. People from Tony’s and Ted’s offices and family members and friends were coaxed like Greg Endo, Bill Howerton, Mark Graven, Cindy Pojas-Smith and Sandy Canha. They would grouse but cover their assigned areas—as quick as they could get away with it. Retired ILWU leader John Arisumi came with a band of predominantly female Filipino ILWU retirees from the cannery and the sugar plantation. On an upcountry canvas, John came back steaming. Someone—no one would admit it—had given his group maps that started them on the bottom of one of the long slopes in Kula. Given the age of his people, he forcefully lectured us that we should have planned better. John ate and left. But the following week, he showed up with his group again. By that time, we would scout the routes on the maps to make sure we started people going downhill as much as possible in Pukalani and elsewhere. Or the younger folks walked those areas ourselves. Canvassing revealed some of the changes of the island’s demographics. In Ha‘ik&#363;, what had been long stretches of local-owned pasture between local homesteads had more residential-looking houses, reflecting the growing number of small subdivisions in the rural and agricultural areas. In Kula, we ran into a lot of fences and gates. In K&#299;hei, the new townhouses posed a challenge to cover. Unlike the GOP which coalesced behind losing U.S. Senatorial candidate Pat Saiki, the Democrats did not line up uniformly to elect Ben. While Ben had a strong showing at the May party convention—climaxed by a demonstration on the floor by delegates supporting the Lt. Gov.—the party steadily moved towards another contested primary. Jack Lewin, Waihe‘e’s health director who had worked on Maui, threw his hat in the primary ring. He seemed to be running against the bureaucracy but his themes didn’t build momentum with local voters. He had a group on the island who did a good job getting out his “Back Jack” bumper stickers. Jack argued that as head of a department with one of the largest workforces, he had wrestled with the bear of large government. But while an interesting image, it didn’t register as well as Pat Saiki’s one note “Fresh Start” theme from the GOP side. As one old campaigner noted, if Jack was using DOH as an example of bad bureaucracy, Jack certainly had already had eight years to make a noticeable difference. The other major opponent in the Democratic Primary was Kau‘i Hill who was better known as the local comedian and activist Bu La‘ia. It was Bu that garnered more of our attention than Jack because the younger people loved the anti-establishment bent of his humor. Some of the people helping us kept threatening to vote for Bu just to send a message. It didn’t matter if he was too young to get on the ballot or that he may have used his brother’s identity to do so. That was all a part of Bu’s attraction. Unlike the Gill-Burns, Ariyoshi-Fasi and Heftel-Waihe‘e battles, Jack never caught enough fire to stop Ben. His campaign on Maui had some letter writers but not much in terms of open grassroots campaign. Jack lost by over 34,000 votes but apparently did garner support from those dissatisfied with the status quo of the party. Like others who lost a gubernatorial campaign, he moved to California after the election. 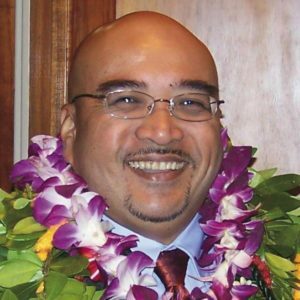 But Ben remained a decided underdog to Saiki and in some people’s mind to the third-party ticket of Frank Fasi and Danny Kaleikini. Mazie Hirono, a liberal firebrand from the State House won the primary as Ben’s running mate. When you campaign on the neighbor islands, you usually have a lot of freedom to schedule your grassroot events. What you don’t have is the candidate very often. We had Ben come over a few times for coffee hours hosted by people like Pundy Yokouchi, Ry Barbin, Ray Ono and Artemio Baxa and his late wife Lucy. Heart & Soul: The 1994 campaign poster personally signed by Ben and Mazie that hangs in Catalina Evangelista’s kitchen. Ben also made it over for one large event before the primary and some coffee hours. After the primary we had Ben and Mazie just a few more times for larger gatherings at Kahului Shopping Center. While Ben trailed Saiki in statewide media poll results, among Filipinos he somehow united the sometimes fractious community. A politician once remarked that the words “United” and “Filipino” were overused. In early 1994, at one of the meetings of the United Filipino Council of Hawai‘i, a Motion was made, seconded, and carried to endorse the historic candidacy of Benjamin Cayetano for Governor. A month later, however, Zach Labez, the UFCH president who was not present at the earlier meeting and who worked for Frank Fasi, tried to maneuver a motion to rescind the endorsement. The motion was supported by Marcos loyalist Joe Lazo. But Fred and other Cayetano supporters including Teamster officials Julio Quiocho and Rey Custodio reminded Labez of the two-thirds requirement to overturn the previous motion for endorsement and the Labez/Fasi/Lazo efforts failed. Even then, many O‘ahu Filipinos were still lukewarm to Ben and a significant amount would volunteer for the Honolulu Mayor race featuring Jeremy Harris and Laoagueño Mito Ablan. On Maui, Pablo Caldito, Pepito Ragasa and Rafael Acoba helped to coordinate a large and enthusiastic Filipino group. It included old veterans like former councilmembers Rick Medina and Vince Bagoyo and other retirees. It also brought out people like Pablo Piano, Virgilio Agcolicol, Zachary Paz and Nick Casumpang. Even decidedly GOP candidates and activists like Danny Agsalog appeared at Cayetano events to lend support. Four years later might be different but in 1994, most Filipinos on Maui who participated in politics were united in Ben as a favorite son. Unfortunately, with the media strategy and spending controlled on O‘ahu, the Maui Filipino group’s ambitious plans for Filipino radio spots and other ethnic appeals was unlikely to be funded. As the designated bearer of bad news for the Maui campaign, I had to tell them “no” repeatedly. In retrospect, I could have been a little more diplomatic about it. 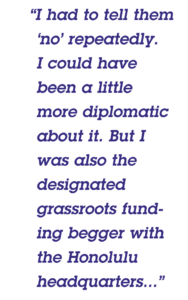 But I was also the designated grassroots funding begger with the Honolulu headquarters—I got the bad news that the money had to be raised locally for almost all efforts as money got funneled into televised showings of Ben’s “Shoot for the Moon” spot. In the end, however, the last big rally was an enthusiastic Mabuhay event that the group helped organize and finance. In 1994, the polls didn’t mean much to us working in the fields. We got decent reactions walking door to door and signwaving. We saw more Lingle people than Saiki people during the months of campaigning. Informally, the different island campaign coordinators had made predictions on the outcome. Given what we had seen and felt in walking the island, we expected to do well on Maui. The campaigners expected to sweep the neighbor island counties but worried about whether O‘ahu would be a big problem. On Maui, we didn’t look at the polls—media or internal. But on election night, we had some doubt. When the first returns indicated Ben and Mazie were ahead on O‘ahu, we didn’t hesitate to declare victory. The party began in earnest because we were very confident that the election was over. Ben and Mazie got 134,000 votes while the best party pairing of Frank and Kaniela finished second. Pat and Fred Hemmings finished third. We had had a part in electing the first Filipino Governor of any state in the union. Gilbert S.C. Keith-Agaran served as Deputy Director of the Department of Land and Natural Resources (DLNR) in the first Cayetano Administration. He would later serve as Deputy Director of the Department of Commerce and Consumer Affairs, Director of Labor briefly, and then Chair of the Board of Land and Natural Resources in the second Cayetano Administration. He currently is the State Senator for Central Maui. Assistant Editor Alfredo G. Evangelista contributed to this column.